Threnching as shown in the sketch above is just a plain flat bottomed groove in a piece of timber. It could be halving joints or it could be check outs in wall plates for studs. It could be housings in the bookcase ends or grooves lengthwise for p anelling. Smaller jobs can be done by a router but larger more serious work is done with a dado or trenching head. . This quick sketch shows one that may be used in a bench saw. 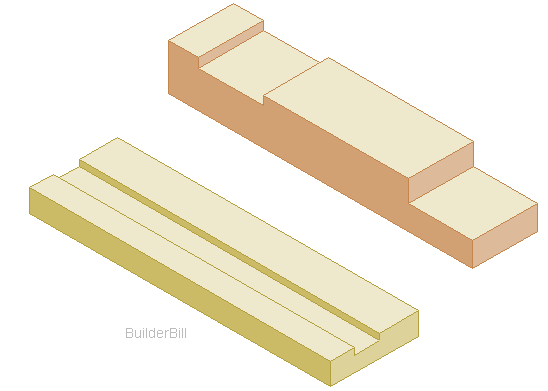 The defining feature of these cutter heads are the saw blade or spur cutters either side and just in front of the cutters that make for neat cuts across the grain. They come in various standard widths and to make odd width cuts then two passes have to be made with a smaller cutterhead. 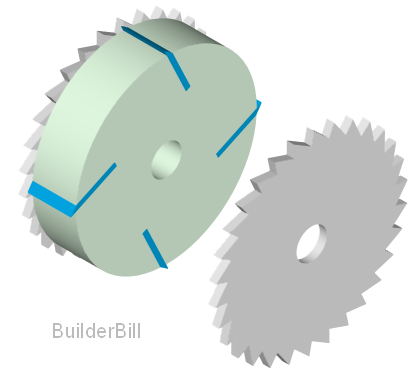 Another pattern has no circular saw blades, but toothed, spur cutters recessed into each side of the cutter block just before the blades. These are very robust tools and capble of giving years of service in a factory environment. With some variations they are fitted and used in spindle moulders, radial arm saws, and tennoning machines etc.